With Pokémon Go fever gripping the bits of the globe currently capable of playing, it’s only a matter of time before other major video game franchise get in on the action. Let’s beat them to the punch, shall we? Update 7.13 — Three days down, three days to go. It’s shaping up to be the sort of ‘Shop Contest people stand around in a park staring at, feeling good about themselves. 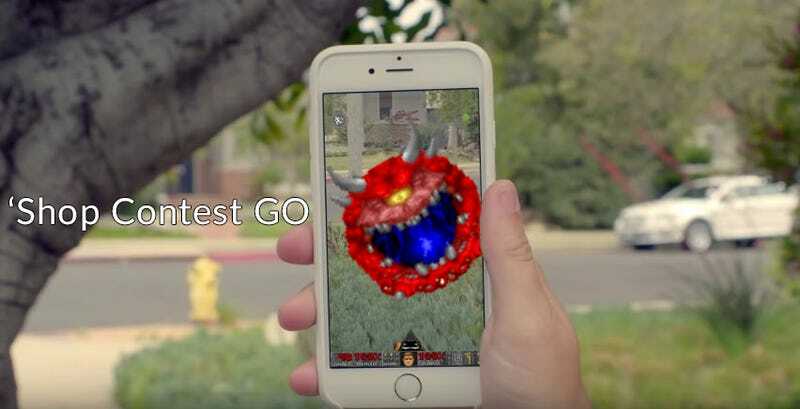 It’s fun to team up with friends and strangers to hunt virtual monsters in augmented reality, but Pokémon are only the beginning.Eventually we’ll be scouring our city streets for rare Yu-Gi-Oh cards, ridding our suburban neighborhoods of hell demons or chasing Sonic the Hedgehog through heavy traffic to beat him to a Chaos Emerald. Anything is possible when you have a picture of someone holding a phone you found on the internet, a place to download the fonts used in Pokémon Go and no need to worry about servers crashing. Give us your best Go-inspired games (screenshots from Lara Croft Go, Hitman Go or Deus Ex Go don’t count.) Come next weekend I’ll do my very best to catch all the good ones and present them to the masses. Happy hunting!